Check out the New Four Leaf Clover Bear! Well, St. Patty’s Day is right around the corner so it is only fitting that Build A Bear brings us a new bear for the season! Check out the new Four Leaf Clover Bear! Thanks to kassiered for the preview picture! Head to the Valentine’s Dance at the Gymnasium! Just a reminder to all of you that the Valentine’s Day Dance is back this year. 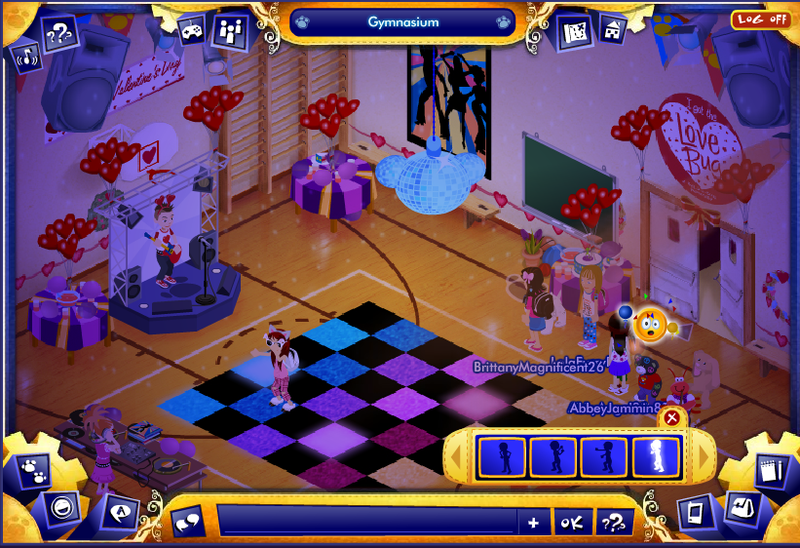 Head over to the Gymnasium and dance to your heart’s content! You will receive 100 bear bills and some holiday candy just for visiting. Thanks to forum member Snewdles for the friendly reminder! Happy Valentine’s Day! Make Sure to Visit Bearemy! Happy Valentine’s Day to all of our friends here at Bearville Insider! Make sure to stop by and visit Bearemy in the Town Square to get your special Valentine’s Day Tee. Thanks to karenbearhug for the reminder! New Valentine Items Available in Bearville! Thank you to several members for pointing out all of the new Valentine items available in Bearville! First off, there is a new Valentine condo available at the Lumbear Yard for 3000 bear bills. The Lumbear Yard also has Rose Bush Seeds available now for purchase for 250 bear bills. It’s an opportunity to make a little extra cash! Year of the Rabbit Pet Now Available at BuildABear.com! To celebrate the “Year of the Rabbit”, BuildABear.com has introduced a new Year of the Rabbit pet. It is a limited availability web exclusive available for $18 USD on the website. This pet was previously only available in Japan. Here is the official site description: “Make this friend to commemorate the year of the Rabbit in 2011! This cuddly stuffed animal rabbit wears a commemorative 2011 tag and has soft white fur.” A photo is shown below and thanks to KathleenJuly8 for bringing this to our attention. The PSIs are the bunny glasses and ears shown below. Make sure to complete your fountain collection this month. If you do, you’ll receive a pawsome “2011″ banner for your cub condo! Thanks to member emmaloo42 for the photo of the entire collection and the prize! Grab Maxine’s January 2011 Gift! Free Gifts in Bearville Coming for the New Year! 1) Visit Bearemy to get a gift. 2) Visit the Gymnasium and get a gift. 3) Visit the bank and click on a bank teller to get 1,000 FREE bear bills to invest! Thanks to member stephaniesparkle for pointing this information out. New Styles at Bee Stylin Salon! For those of you who are into hair and facial styles, the Bee Stylin Salon is now featuring two new faces and three new hair options! Thanks to member AshleyLuvs2Dance for bringing this to our attention. Bearville has finally added highlights to the hair options! Check them out below!